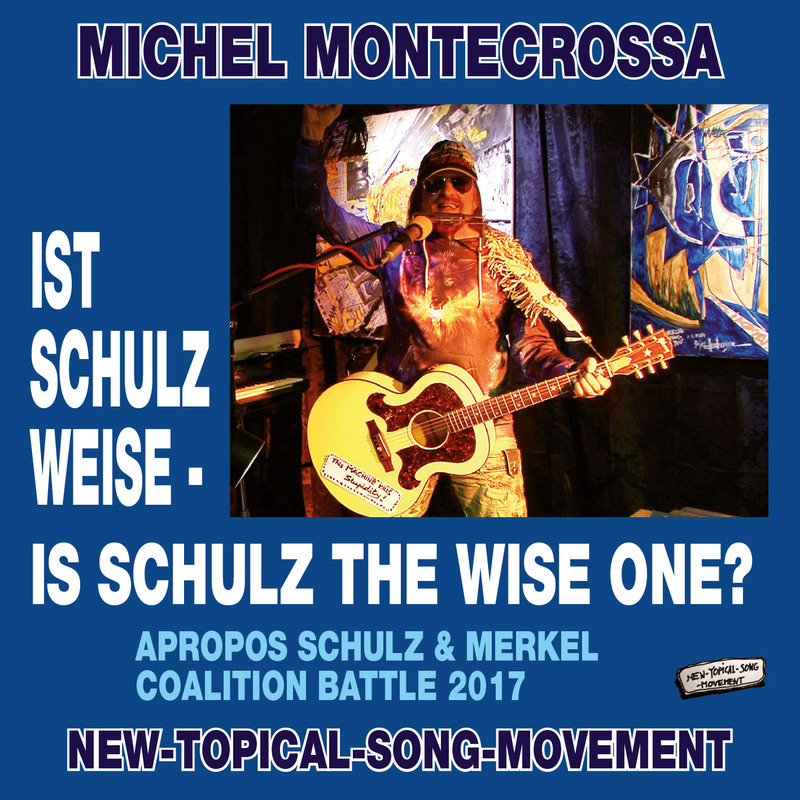 ‘Ist Schulz Weise – Is Schulz The Wise One?’, veröffentlicht von Mira Sound Germany auf Audio Single, DVD und als Download, ist Michel Montecrossa’s New-Topical-Song apropos Schulz & Merkel Koalitions Battle 2017. ‘Ist Schulz Weise – Is Schulz The Wise One?’ entstand inmitten der deutschen Schulz/Merkel Koalitions Battle 2017 und der Entscheidung für Staatsmann Kultur, die gut für Deutschland ist oder für Polito-Korrupto Opportunismus, der schlecht für Deutschland ist. 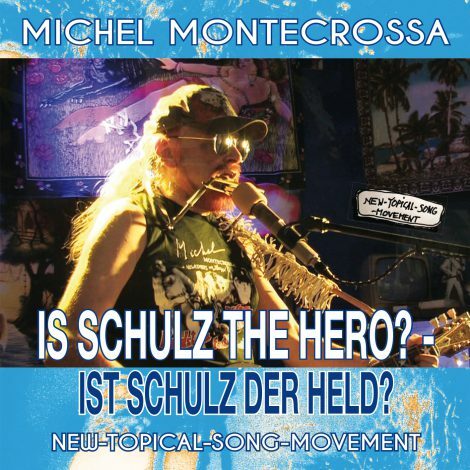 ‘Ist Schulz Weise – Is Schulz The Wise One?’, released by Mira Sound Germany on Audio Single, DVD and as Download, is Michel Montecrossa’s New-Topical-Song apropos Schulz & Merkel Coalition Battle 2017. ‘Ist Schulz Weise – Is Schulz The Wise One?’ was written right in the middle of the German Schulz/Merkel Coalition Battle 2017 and the decision for Statesmanship that’s good for Germany or Polito-Corrupto opportunism that’s bad for Germany. “Der Unterschied zwischen einem Staatsmann und einem Polito-Korrupto ist, dass ein Staatsmann für das Wohl der Nation arbeitet und ein Polito-Korrupto nur für sein eigenes Wohlergehen. Vor diesem Hintergrund musste Deutschland 2017 die historische Entscheidung für eine handlungsfähige Koalition und das Gewinnertor treffen oder für einen Polito-Korrupto Opportunismus und das Verlierertor. Kann enttäuschte Liebe zu Freundschaft werden? / Ist Schulz weise, bereit mit Merkel zu reden? / Müssen alte Leute immer gefährlich sein, / uncool und unbeweglich? Can disappointed love turn into friendship? / Is Schulz the wise one, ready to talk with Merkel? / Must old people always be dangerous, / uncool and so frozen? Jung sein heißt lebendig sein, / offen zum frohen Leben. / Ist Schulz weise, bereit mit Merkel zu reden? / Deutschland, Europa und die ganze Welt erwarten das. / Politik ist kein Erwachsenen Kindergarten. To be young means to be living, / open to the happy life. / Is Schulz the wise one, ready to talk with Merkel? / Germany, Europe and the whole world expect it. / Politics is not a kindergarten for grown-ups. Alte Leute müssen nicht gefährlich sein / und im Wege stehen dem jungen Leben. / Ist Schulz weise, bereit mit Merkel zu reden? / Zusammenarbeit ist jetzt gefragt für ein starkes Deutschland. Old people don’t have to be dangerous / and stand in the way of young life. / Is Schulz the wise one, ready to talk with Merkel? / Cooperation now is needed for a strong Germany. 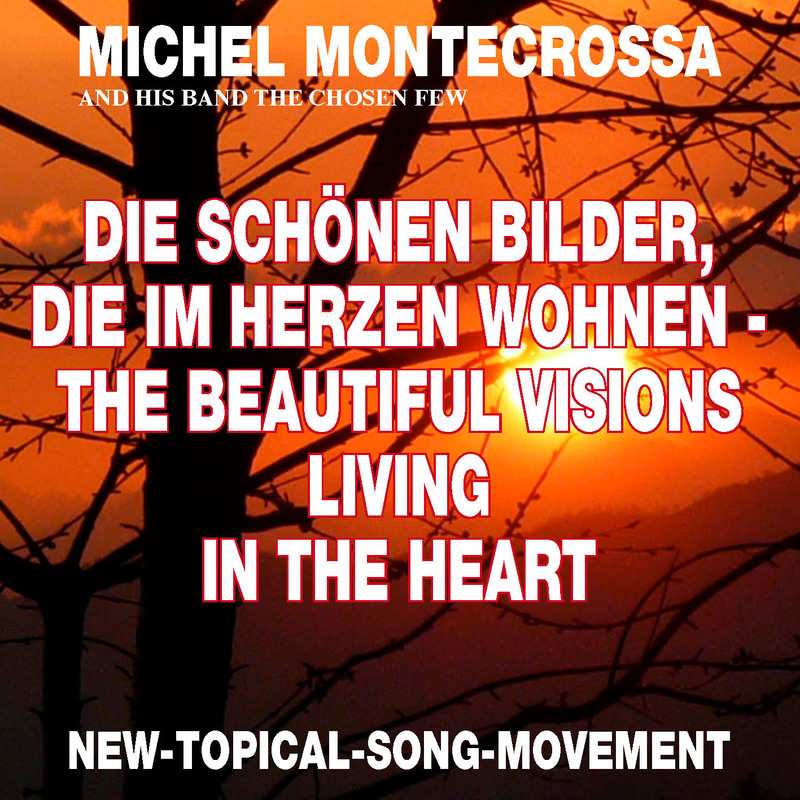 With his New-Topical-Song ‘Die Schönen Bilder, Die Im Herzen Wohnen – The Beautiful Visions Living In The Heart’, released by Mira Sound Germany on Audio-CD, DVD and as Download, Michel Montecrossa gives a true answer to the question of violence and mass killing as it happened in Texas at the Sutherland Springs church shooting. Die schönen Bilder, die im Herzen wohnen, / die Bilder der Liebe himmelgeboren, / kommend von dem Ort ohne Kummer und Sorgen: / Ich zeig sie dir alle für dich und deinen Morgen. The beautiful visions living in the heart, / the visions of love from heaven born, / coming from the place free of pain and sorrow: / I show them all to you for your tomorrow. Die Bilder werden zu Gedanken, die leuchten, / Gedanken über uns und was wir werden können. / Wie Sterne sind wir dann hell in der Nacht, / strahlend für alle mit Liebesmacht. Visions becoming thoughts of light / about us and what we can become. / Like stars are we then bright in the night: / shining for all with loving might. Durch das Leben eilen wir wie Kinder / und werden für immer Kinder sein: / in der Liebe geeint, auf die Freude vertrauend, / aus der glücklichen Träne das Lachen zaubernd. Like children we hurry through life / and forever like children will fly: / in love united, trusting in hope, / setting free the happy tear of laughing. 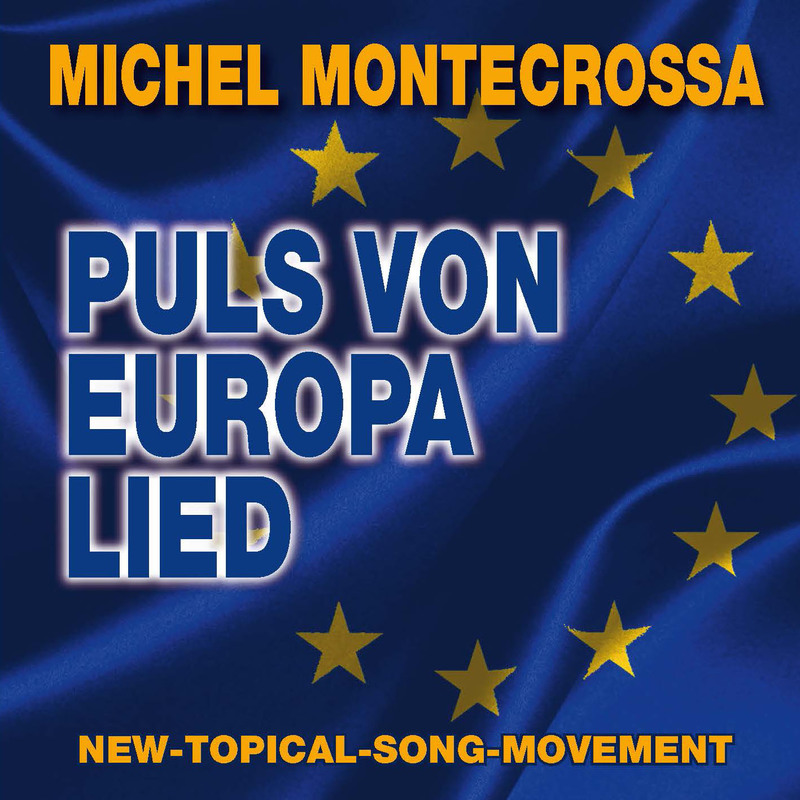 ‘Talking Brexit – Über Brexit Reden’ is Michel Montecrossa’s New-Topical-Song apropos the British ’no’ to Europe which he sees as a totally wrong decision and a crime against the future of the young. 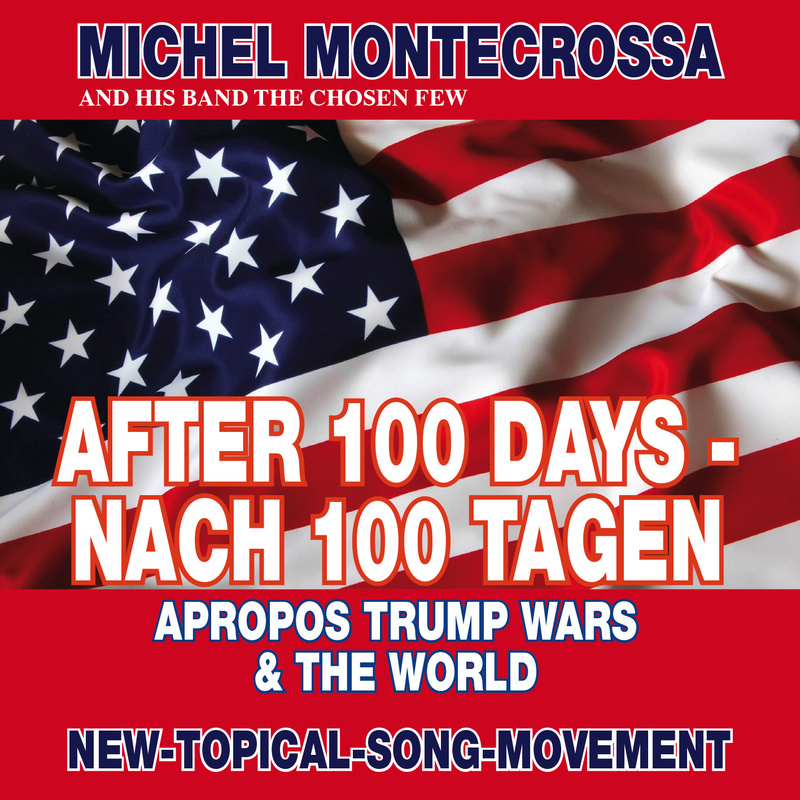 Michel Montecrossa sees the EU as an indispensable step towards the Eurasian Union with its great potential for free trade, jobs and prosperity as a way to the United States of Planet Earth. Former Prime Minister Tony Blair too forcefully urged opponents of a British withdrawal from the European Union to “rise up” and persuade others to rethink their decision to leave the EU. ‘Is Schulz The Hero? – Ist Schulz Der Held?‘, released by Mira Sound Germany on Audio Single, DVD and as Download, is Michel Montecrossa’s New-Topical-Song apropos Martin Schulz 2017 wanting to become German Chancellor. Michel Montecrossa in his song asks for a Chancellor of Action and Global Satisfaction of humanity’s need for progress. A new Germany must stand for unity of the whole world bringing sweeping changes. Michel Montecrossa wants to know: Is Martin Schulz a strong politician who delivers or another polito-corrupto talking crap? Is Schulz the Hero? / Ist Schulz der Held? / Is he leading the E.U. / with a strong Germany? / Führt er die E.U. mit einem starken Deutschland? Is Schulz the Hero? / Ist Schulz der Held? / Is he ending Russia sanctions? / Is he uniting Germany and the E.U. / with Russia and China for building with all the nations / the great Eurasian free-trade continent? Is Schulz the Hero? / Ist Schulz der Held? / Beendet er Russland Sanktionen? / Vereint er Deutschland und die E.U. mit Russland und China, / um aufzubauen mit allen Nationen / den großen Eurasischen Freihandels-Kontinent? Thus ending the Ukraine crisis? / Damit beenden die Ukraine Krise? / Thus bringing big Eurasia Business? / Damit bringend große Eurasien Geschäfte? / And is he bringing Turkey into the E.U.? / Und bringt er die Türkei in die E.U.? Is Schulz thinking great? / Denkt Schulz im Großen? / Does he understand World Union? / Versteht er die Weltvereinigung? / Does he help to build the United States of Planet Earth? / Hilft er beim Entstehen der Vereinigten Staaten des Planeten Erde? Is Schulz the Hero? / Ist Schulz der Held? / Is he leading the E.U. / with a strong Germany? / Führt er die E.U. / mit einem starken Deutschland? 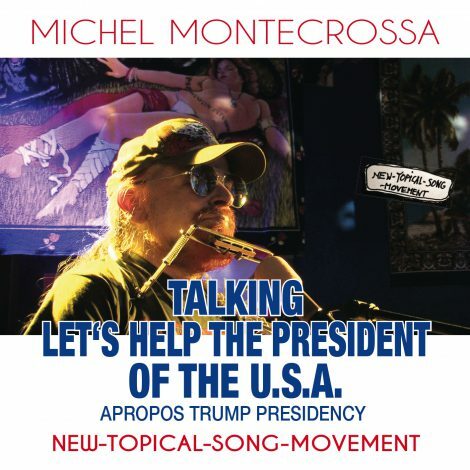 ‘Talking Let’s Help The President Of The U.S.A.‘, released by Mira Sound Germany on Audio Single, DVD and as Download, is Michel Montecrossa’s New-Topical-Song apropos Trump Presidency and the fact that Love, Goodwill and Cooperation pave the way to World Unity. It is a song about the fact that the greatness of a nation is determined by its readiness to stand for and move towards World Unity. It is a song about the fact that through this movement of Love all nations can help each other and that to help the USA President to understand this would mean to help to make America great again. Let’s help the President of the U.S.A. / to make America great again. / I‘m a European artist-singer. / My passport is German and I say: / “Germany First!” That‘s what I say. / Germany is good, it will help you / on your way. German cars are top in the world. / We build them for you in the great U.S.A. / We build them in China and Mexico too. / We build them in countries all over the globe. / We give American People work and money. / The ancestor of your President is a German, you know. Sure, we are partners, our nations are great. / Sure, we make the world a better place. / Our blood is as red as is the blood of you. / We are proud to stand for Humanity with you / and thus ‘Germany First’ will help the U.S.A. People / to make America great again. 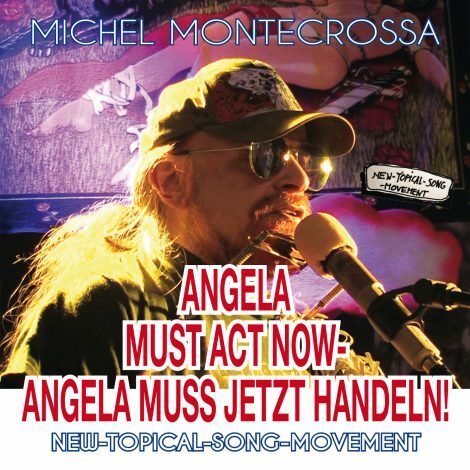 ‘Angela Must Act Now – Angela Muss Jetzt Handeln!‘, released by Mira Sound Germany on Audio Single, DVD and as Download, is Michel Montecrossa’s New-Topical-Song For A Strong German Future and a call to Angela Merkel to earn Karma Points. The New-Topical-Song ‘Talking: Theresa May, Give Back The European Unity! – Ich Sage: Theresa May, Gib Zurück Die Europäische Einheit!‘, released by Mira Sound Germany on Audio Single, DVD and as Download, is Michel Montecrossa’s No-Brexit Song. 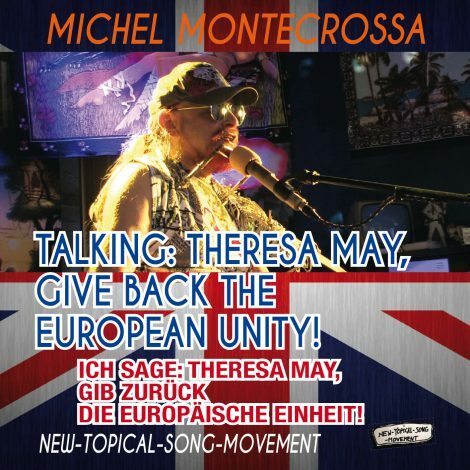 Michel Montecrossa’s bilingual English/German New-Topical-Song ‘Talking: Theresa May, Give Back The European Unity! – Ich Sage: Theresa May, Gib Zurück Die Europäische Einheit!’ takes a stand for Great Britain staying in the EU. 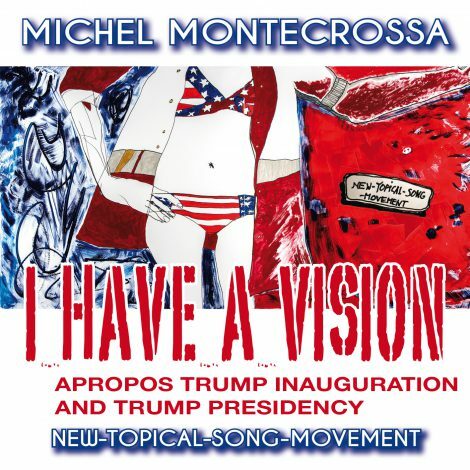 The New-Topical-Song ‘I Have A Vision’, released by Mira Sound Germany on Audio Single, DVD and as Download, is Michel Montecrossa’s Song apropos the Trump Inauguration and Presidency. ‘I Have A Vision‘ is the ultra-cool no-pretension Reality Rocker New-Topical-Song and Movie of 68 Deep-Brain-Words by Michel Montecrossa apropos Trump inauguration and Trump presidency. where Martin Luther King’s ‘I Have A Dream’ began. of the United States of Planet Earth. of the U.S.A. taking the lead on this way. of the U.N. changing into the world government. of the United Humanity moving into space age. 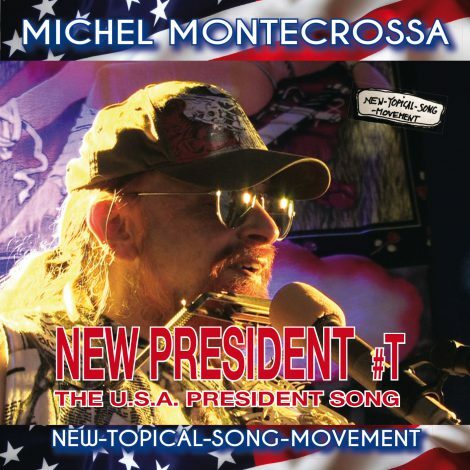 The New-Topical-Song ‘New President #T‘, released by Mira Sound Germany on Audio Single, DVD and as Download, is Michel Montecrossa’s USA President Song apropos the Trump Inauguration and Presidency. It is a song looking beyond smallness into the greater meaning of U.S.A. Presidency. “THE U.S.A. PRESIDENT MUST BE A PERSON WHO IS CONSCIOUS OF THE TRUE DESTINY OF THE U.S.A. TO BE THE LEADER TOWARDS HUMAN UNITY. THE U.S.A. PRESIDENT MUST BE GOVERNED BY THE WISH TO HELP TO MAKE REAL THIS HIGHEST AND NOBLEST IDEAL OF MANKIND BY TAKING THE LEAD IN THE BUILDING OF THE UNITED STATES OF PLANET EARTH FOR THE GOOD OF ALL. New President, new power. / New action, new intentions. / And I hope for sure: / new also the direction. New President in our country. / New President in another country. / New President in any country. / New President – who is that? One President there is / almost no one knows, / looking after all the things / human and more. New President, wherever you are. / New President, whoever you are: / take the lead. Show the way / of the one I mentioned. Don’t be another fool / believing himself to be someone / without really knowing the one: / Don’t be such a fool. Don’t be another President / but be the true one / telling truth, bringing peace, / working for World Union on this Earth. The New-Topical-Song ‘Singin’ For The Young – Für Die Jugend Singen’, released by Mira Sound Germany on Audio Single, DVD and as Download, is Michel Montecrossa’s Youth Song 2017. 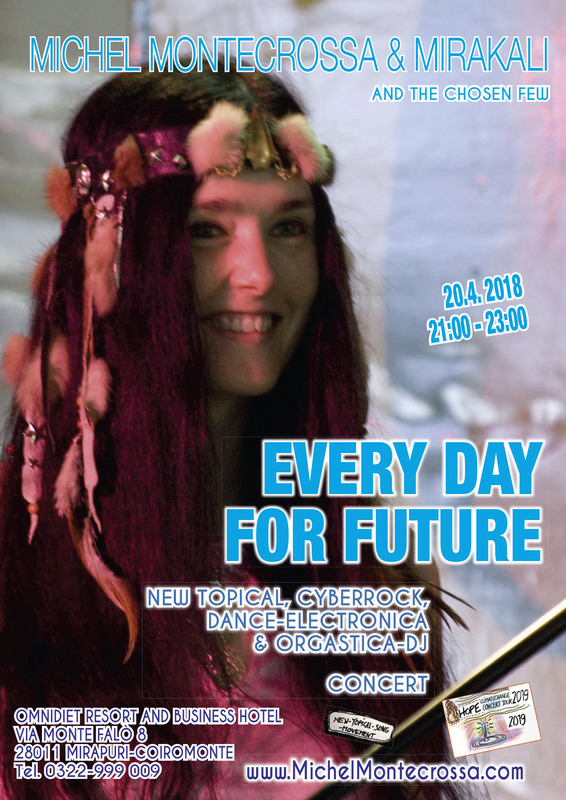 Michel Montecrossa’s bilingual English/German New-Topical-Song ‘Singin’ For The Young – Für Die Jugend Singen’ is a wake-up song to be young, taking a stand for the young who are the power that can really do. We are young and we know what we do. / We are the young, are the power, of course! / We are the power that can really do. / We are the young, are the wonderful. Wir sind die Jugend und wissen, was wir tun. / Wir sind die Jugend, sind die Kraft, na klar! / Wir sind die Kraft, die wirklich kann. / Wir sind die Jugend, sind die Wunderbaren. School and youth and rebellion – / we aren’t perfect but are sweet. / For discouraged souls we sing from the heart so deep. / We are the others, we are we! Schule und Jugend und Rebellion – / wir sind nicht vollkommen, aber süß. 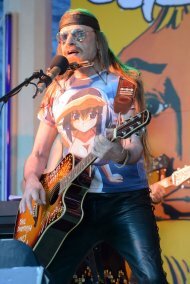 / Für mutlose Seelen singen wir aus dem Herzen tief. / Wir sind die anderen, wir sind wir! Get the demons out of the system. / Club 27 ain’t good for you. / Be the good ones and the good lovers too. / I’m the good friend / that knows what we really want to do. Verjagt die Dämonen aus dem System. / Klub 27 tut euch nicht gut. / Seid die Guten und die gut Liebenden dazu. / Ich bin der gute Freund, / der weiß, was wir wirklich gerne tun.